Goldbug was once a young Cybertronian drifter known as Bumblebee. He survived on the streets of Polyhex with no real purpose. Over time he became skilled at sneaking around, stealing, eavesdropping, and blackmailing. When he heard of a new cause being led by Optimus Prime, he eagerly joined the Autobots in hopes of finding a place to belong and where his unsavory activities would be tolerated. When the war began Bumblebee showed extreme bravery in battle and often sought ways to be noticed by command. In time, he worked his way up the ranks of the Autobots and when the Autobot Seeker Drench was destroyed, Bumblebee was offered an upgraded form and a new identity as Goldbug, to take his place. Although he holds a high position in the Autobot hierarchy, he is paranoid that someone will one day try to betray him and take his place as he has done to so many others in the past. Remarks: Goldbug is a remold of Cybertron Hot Shot, so see the whole review there. Just some words on the differences. Goldbug might be the most interesting repaint of the 2008 Botcon set. I really like his colour scheme with the black and yellow. I didn't think I'd like the blue head, but it kind of fits him well, so no complaints here. A very pleasing-looking figure. The Hot Shot mold from Cybertron is also a very nice figure overall. The vehicle mode looks awesome, the spoiler-wing gimmick is pretty nifty, and the robot, while not as posable as others, is doing a good job as well. 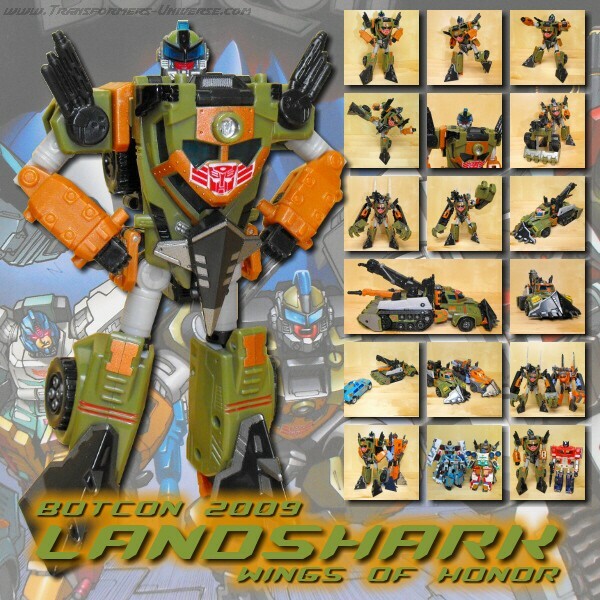 Goldbug saw but very little action in the Botcon 2008 comic book, but seeing him take his place as one of the Seekers to hunt down and destroy Decepticons was pretty nice. So overall a very nice figure, no complaints at all. Near the top of the set.